An American living in Morocco tells how he learned to fluff couscous and simmer tagines at Dar Liqama, a new cooking school in an opulent villa near Marrakech surrounded by thousands of palm trees. I never expected to be up to my wrists in couscous, but there I was in a kitchen just outside Marrakech, Morocco, with my hands submerged in a bowl of wet semolina. I was massaging the sandy grains with my fingers, scooping them up from a mixing bowl and letting them fall back down, adding splashes of bottled water to keep everything moist. My goal was to make sure the couscous didn't stick together. The secret was hands-on contact (no spoons), an eye for errant lumps andmost important of allthe patience to keep working the grains until they reached the perfect texture. In the year since I'd moved with my family from New York to Marrakech, I still hadn't had the opportunity to learn how to cook the local cuisine, an earthy-elegant fusion of Persian, Andalusian, Turkish, French and Jewish influences. Our family is lucky enough to have a cook, Maria Ounzal, who puts delicious Moroccan dishes on our table each day, but the downside is that I rarely end up spending any time in the kitchen myself. When I found out about a school in a villa near Marrakech that was offering a crash course in how to cook classic Moroccan dishes, I couldn't pass up the chance to sign on. The Dar Liqama cooking schooloperated by the England-based Rhode School of Cuisine, which also runs programs in France and Italywas launched in 2002 in a beautiful villa in the Palmeraie, a quiet area of ancient date palms and opulent mansions. The Palmeraie is to Marrakech what Bel Air is to Los Angeles, though it has the bonus of the snowy-peaked Atlas Mountains as a backdrop. Bold-face-name types like Fiat heiress Marella Agnelli have gated homes here, close to villas that are rented by people such as Donna Karan and swank hotels. Like those grand houses, Dar Liqamathe name translates to the House of Green Mint, in honor of the popular local teais at the end of a bumpy dirt road. Heavy wooden gates creak open to reveal a lovely earth-red stucco mansion. As I explored, I was happy to discover that the property has its own tennis courts, pools and a hammam, or traditional steam bath. The villawhich can be rented when the cooking school is not in sessionalso has a serene central courtyard, anchored by a marble fountain in the shape of an eight-pointed star, and an ornately tiled staircase embellished with lacy wrought-iron details that makes every descent feel like a grand entrance. Students stay in the eight comfortable bedrooms, each of which has an elaborately tiled fireplace to counter Marrakech's cool nights. As educational institutions go, Dar Liqama is pretty plush. Students spend mornings and afternoons with head cook Bouchra Derraqui in the sunny kitchen, where russet-colored walls are lined with shelves laden with jars of locally grown olives and lemons. (The school also offers optional trips to local food markets and sights like the Koutoubia Minaret and the Yves Saint Laurent-maintained Jardin Majorelle.) Initially, my classwhich had three other Americans and an Englishwomanwas disconcerted to hear that Bouchra and her assistant, Imane Driwa, speak only Arabic and French, but we quickly discovered that language wasn't an obstacle to learning. Khalil Guerrouai, the villa's manager and class director, who supervised the sessions, translated every one of Bouchra's directions into rapid-fire English, with all the enthusiasm of a carnival barker. He cajoled, he joshed, he admonished. "Meloney, you must cut the vegetables smaller," he wailed, speaking for Bouchra, as the class chopped turnips for fluffy seven-vegetable couscous with cumin and the hot sauce harissa. "We have five mouths to feed." Many of Bouchra's tips required no translation: She communicated clearly with her facial expressions and skilled hands. To demonstrate the fine points of crafting the crescent-shaped pastry known as a qa'b el-gh'zal, or gazelle's horn, Bouchra gently cupped her hands around Meloney's, guiding Meloney's thumbs and forefingers to make the gazelle's horn higher and more sculptural. 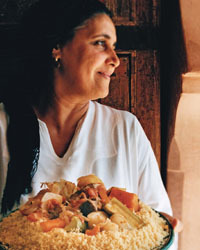 The school teaches about 30 recipes in its curriculum, which was developed with the help of Anissa Helou, the London-based author of four cookbooks, including Café Morocco. Students learn how to make stews such as chicken tagine and l'ham bel barquqcubes of lamb cooked with ginger, honey and prunes, which form a luscious, slightly sticky sauceand traditional salads, such as a wonderfully tangy one with chilled beets called shlada del barba. Bouchra showed us how to cut the roasted beets into small, perfectly even pieces (as with Japanese food, detail is part of Moroccan cuisine's appeal) and toss them with a tart lemon-juice dressing. Moroccan cooks like to use the smallest vegetables possibleeggplants the size of tennis balls, finger-length carrotsbecause they consider them more tender and flavorful. The results of these lessons became our lunches and dinners. Our meals took place in the villa's handsome dining room, or on the terrace outside the kitchen, at a tiled table topped with vases of bright orange roses and jacaranda fronds. As we ate, Khalil passed around bottles of Moroccan rosé, which paired well with the hearty dishes. By the end of that week, my class was proud of its new Moroccan cooking skills, and eager to practice them at home. Many of the recipes, I learned, are ridiculously easyalmost too easy, actually, and therefore ruined if the cook is overly ambitious. That's probably why the best food in this country is made not in restaurants but in private homes, by women who learned from their mothers and grandmothers. Maria, my family's talented cook, nodded approvingly when I told her about my cooking-class experience, but I quickly discovered she was less than enthusiastic about letting me loose in the kitchen. After all, this is her turf, and I'm still an amateur. But the next time I visit friends in New York, I know what we're having for dinner. Mitchell Owens, a consulting editor at Elle Decor, has written for the New York Times and Travel + Leisure.